The breed derives its name from Kallibunker's hometown of Cornwall, England and the term "rex," which refers to a similiar coat pattern in rabbits. The coat is very short, lies close to the body and is incredibly soft to the touch, prompting comparisons to cut velvet, karakul lamb, rabbit fur or silk. This breed has a distinct head and body type. Large ears are set high on a comparatively small, egg-shaped head with high cheekbones, hollow cheeks, and a high-bridged Roman nose and strong chin. The body has been compared to a Whippet dog’s because of its arched back, barrel chest, small waist and very long, fine legs. In spite of their dainty appearance, these small to medium sized cats are extremely hard-bodied and muscular, using their well developed hips and long legs for fast starts and stops, quick turns and high jumps. The Cornish Rex is extremely affectionate and people oriented. They are also active cats whose kitten-like antics last for their lifetime and who can be very inventive in their play. Favourite Cornish Rex games are fetch and catch, even picking small objects up in its paw to toss around. In spite of their sophisticated, elegant appearance, Cornish Rex cats are anything but cool, aloof or dignified. They are perfect pets for the owner who wants active cats to participate in family life. 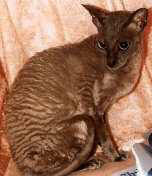 Some people have the impression that the Cornish Rex does not shed and is hypoallergenic. This is not strictly true. All animals are constantly renewing their coats as old hairs are replaced by new ones. While Cornish Rex hairs are not easy to find lying on the furniture, they are there and owners will find them clinging to some fabrics. By comparison to some other cats, the shedding is minimal. Even so, most allergic people are bothered by the dander (dead skin cells) and the saliva, both of which are present in Cornish Rex cats. The coat's unusual hairs are short and wavy, existing in nearly thirty colours including solid, shaded, tabby and particolour. © 2006-2019 AnimalPets.org. Page generation 0.002 seconds. Web design with Incode Group on scale.